Description #72 is a 15" seat. 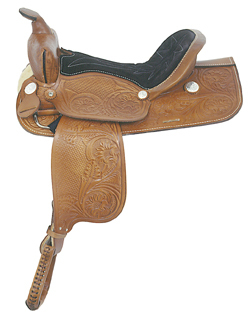 Features full basket weave and floral tooling and silver conchos. Choose from 15" or 16" seat. Medium oil only. Tree: Ralide‚ Swell 121/2", Gullet width 61/2" Semi-quarter horse bars; Weight: Approx. 32 lbs. ; Horn: Height 23/4", Diameter 23/4", Leather-covered; Cantle Height: 3" (4" on 16" seat); Skirt Length: 24"; Skirt Width: 11"; Stirrup Leathers: 2" with double-tongue buckles; Stirrups: Hand-laced leather-covered contest; Rigging: Steel dees in front, rear reinforced billet accesses.